The official Chinese designation for the major branches of Chinese is fāngyán (方言, literally "regional speech"), whereas the more closely related varieties within these are called dìdiǎn fāngyán (地点方言/地點方言 "local speech"). Conventional English-language usage in Chinese linguistics is to use dialect for the speech of a particular place (regardless of status) and dialect group for a regional grouping such as Mandarin or Wu. Because varieties from different groups are not mutually intelligible, some scholars prefer to describe Wu and others as separate languages. Jerry Norman called this practice misleading, pointing out that Wu, which itself contains many mutually unintelligible varieties, could not be properly called a single language under the same criterion, and that the same is true for each of the other groups. Hymes, Dell (1971), "Sociolinguistics and the ethnography of speaking", in Ardener, Edwin (ed. ), Social Anthropology and Language, Routledge, pp. 47–92, ISBN 978-1-136-53941-1. Kornicki, P.F. (2011), "A transnational approach to East Asian book history", in Chakravorty, Swapan; Gupta, Abhijit (eds. ), New Word Order: Transnational Themes in Book History, Worldview Publications, pp. 65–79, ISBN 978-81-920651-1-3. Norman, Jerry (2003), "The Chinese dialects: phonology", in Thurgood, Graham; LaPolla, Randy J. (eds. ), The Sino-Tibetan languages, Routledge, pp. 72–83, ISBN 978-0-7007-1129-1. Sohn, Ho-Min; Lee, Peter H. (2003), "Language, forms, prosody, and themes", in Lee, Peter H. (ed. ), A History of Korean Literature, Cambridge University Press, pp. 15–51, ISBN 978-0-521-82858-1. Thomason, Sarah Grey (1988), "Languages of the World", in Paulston, Christina Bratt (ed. ), International Handbook of Bilingualism and Bilingual Education, Westport, CT: Greenwood, pp. 17–45, ISBN 978-0-313-24484-1. The Great Wall of China refers to a series of fortifications generally built across the historical northern borders of China to protect and consolidate territories of Chinese states and empires against various nomadic groups of the steppe and their polities. Several walls were being built from as early as the 7th century BC; these were later joined together and made bigger by Qin Shi Huang (220–206 BC), the first Emperor of China. Little of that wall remains. Later on, many successive dynasties have repaired, maintained, and newly built multiple stretches of border walls. The most well-known of the walls were built during the Ming dynasty (1368–1644). Apart from defense, other purposes of the Great Wall have included border controls, allowing the imposition of duties on goods transported along the Silk Road, regulation or encouragement of trade and the control of immigration and emigration. Furthermore, the defensive characteristics of the Great Wall were enhanced by the construction of watch towers, troop barracks, garrison stations, signaling capabilities through the means of smoke or fire, and the fact that the path of the Great Wall also served as a transportation corridor. The frontier walls built by different dynasties have multiple courses. Collectively, they stretch from Liaodong in the east to Lop Lake in the west, from present-day Sino-Russian border in the north to Qinghai in the south; along an arc that roughly delineates the edge of Mongolian steppe. A comprehensive archaeological survey, using advanced technologies, has concluded that the walls built by the Ming dynasty measure 8,850 km (5,500 mi). This is made up of 6,259 km (3,889 mi) sections of actual wall, 359 km (223 mi) of trenches and 2,232 km (1,387 mi) of natural defensive barriers such as hills and rivers. Another archaeological survey found that the entire wall with all of its branches measures out to be 21,196 km (13,171 mi). Today, the defensive system of Great Wall is generally recognized as one of the most impressive architectural feats in history. Mainland China, also known as the Chinese mainland, is the geopolitical as well as geographical area under the direct jurisdiction of the People's Republic of China (PRC). It includes Hainan island and strictly speaking, politically, does not include the special administrative regions of Hong Kong and Macau, even though both are partially on the geographic mainland (continental landmass). Nèidì (内地; 內地), literally "inland" or "inner land".In the PRC, the usage of the two terms are strictly speaking not interchangeable. To emphasize "equal footing" in Cross-Strait relations, the term must be used in official contexts with reference to Taiwan, with the PRC referring to itself as "the mainland side" (as opposed to "the Taiwan side"). But in its relations with Hong Kong and Macau, the PRC government refers to itself as "the Central People's Government", and Mainland China excluding Hong Kong and Macau is referred as Nèidì. "Mainland area" is the opposing term to "free area of the Republic of China" used in the ROC Constitution. A metropolitan area, sometimes referred to as a metro area or commuter belt, is a region consisting of a densely populated urban core and its less-populated surrounding territories, sharing industry, infrastructure, and housing. A metro area usually comprises multiple jurisdictions and municipalities: neighborhoods, townships, boroughs, cities, towns, exurbs, suburbs, counties, districts, states, and even nations like the eurodistricts. As social, economic and political institutions have changed, metropolitan areas have become key economic and political regions. Metropolitan areas include one or more urban areas, as well as satellite cities, towns and intervening rural areas that are socioeconomically tied to the urban core, typically measured by commuting patterns. In the United States, the concept of the metropolitan statistical area has gained prominence. The pinyin system was developed in the 1950s by many linguists, including Zhou Youguang, based on earlier forms of romanizations of Chinese. It was published by the Chinese government in 1958 and revised several times. The International Organization for Standardization (ISO) adopted pinyin as an international standard in 1982, and was followed by the United Nations in 1986. The system was adopted as the official standard in Taiwan in 2009, where it is used for international events rather than for educational or computer-input purposes. But "some cities, businesses, and organizations, notably in the south of Taiwan, did not accept this", so it remains one of several rival romanization systems in use.The word Hànyǔ (simplified Chinese: 汉语; traditional Chinese: 漢語) means 'the spoken language of the Han people', while Pīnyīn (拼音) literally means 'spelled sounds'. Traditional Chinese characters are currently used in Hong Kong, Macau, and the Republic of China (Taiwan). While traditional characters can still be read and understood by many mainland Chinese and the Chinese community in Malaysia and Singapore, these groups generally retain their use of simplified characters. Overseas Chinese communities generally tend to use traditional characters.Simplified Chinese characters may be referred to by their official name above or colloquially (简体字; jiǎntǐzì). The latter refers to simplifications of character "structure" or "body", character forms that have existed for thousands of years alongside regular, more complicated forms. 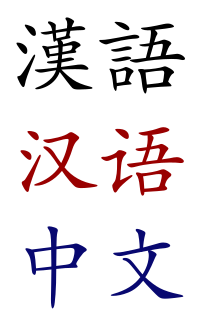 On the other hand, the official name refers to the modern systematically simplified character set, which (as stated by then-Chairman Mao Zedong in 1952) includes not only structural simplification but also substantial reduction in the total number of standardized Chinese characters.Simplified character forms were created by reducing the number of strokes and simplifying the forms of a sizable proportion of Chinese characters. Some simplifications were based on popular cursive forms embodying graphic or phonetic simplifications of the traditional forms. Some characters were simplified by applying regular rules, for example, by replacing all occurrences of a certain component with a simplified version of the component. Variant characters with the same pronunciation and identical meaning were reduced to a single standardized character, usually the simplest amongst all variants in form. Finally, many characters were left untouched by simplification, and are thus identical between the traditional and simplified Chinese orthographies. Some simplified characters are very dissimilar to and unpredictably different from traditional characters, especially in those where a component is replaced by a simple symbol. This has led some opponents of simplification to complain that the 'overall process' of character simplification is arbitrary. Proponents counter that the system of simplification is straightforward and internally consistent. Proponents have also emphasized a some particular simplified characters as innovative and useful improvements, although many of these have existed for centuries as longstanding and widespread variants.A second round of simplifications was promulgated in 1977, but was later retracted in 1986 for a variety of reasons, largely due to the confusion caused and the unpopularity of the second round simplifications. However, the Chinese government never officially dropped its goal of further simplification in the future.In August 2009, the PRC began collecting public comments for a modified list of simplified characters. The new Table of General Standard Chinese Characters consisting of 8,105 (simplified and unchanged) characters was officially implemented for use by the State Council of the People's Republic of China on June 5, 2013. Owned by ByteDance, the app was launched as Douyin in China in September 2016 and introduced to the overseas market as TikTok one year later. In 2018, the application gained popularity and became the most downloaded app in the U.S. in October 2018. As of 2018, it is available in over 150 markets, and in 75 languages. In July 2018, the app had more than 500 million users globally. The time in China follows a single standard time offset of UTC+08:00 (eight hours ahead of Coordinated Universal Time), despite China spanning five geographical time zones. The official national standard time is called Beijing Time (Chinese: 北京时间) domestically and China Standard Time (CST) internationally. Daylight saving time has not been observed since 1991.The special administrative regions (SARs) maintain their own time authorities, with standards called Hong Kong Time (香港時間) and Macau Standard Time (澳門標準時間). These have been equivalent to Beijing time since 1992. Xiaomi Corporation (; Chinese: 小米 [ɕjǎu.mì] (listen)) is a Chinese electronics company headquartered in Beijing. Xiaomi makes and invests in smartphones, mobile apps, laptops, and related consumer electronics.Xiaomi released its first smartphone in August 2011 and rapidly gained market share in China to become the country's largest smartphone company in 2014. At the start of second quarter of 2018, Xiaomi was the world's fourth-largest smartphone manufacturer, leading in both the largest market, China, and the second-largest market, India. Xiaomi later developed a wider range of consumer electronics, including a smart home (IoT) device ecosystem.Xiaomi has 15,000 employees in China, India, Malaysia, Singapore and is expanding to other countries including Indonesia, the Philippines, and South Africa. According to Forbes magazine, Lei Jun, the founder and CEO, has an estimated net worth of US$12.5 billion. He is China's 11th richest person and 118th in the world. Xiaomi is the world's 4th most valuable technology start-up after receiving US$1.1 billion funding from investors, making Xiaomi's valuation more than US$46 billion. Yue or Yueh (English: or ; Cantonese pronunciation: [jyːt̚˧˥]) is one of the primary branches of Chinese spoken in southern China, particularly the provinces of Guangdong and Guangxi, collectively known as Liangguang. The name Cantonese is often used for the whole branch, but linguists prefer to reserve that name for the variety of Guangzhou (Canton), Hong Kong and Macau, which is the prestige dialect. Taishanese, from the coastal area of Jiangmen located southwest of Guangzhou, was the language of most of the 19th-century emigrants from Guangdong to Southeast Asia and North America. Most later migrants have been speakers of Cantonese. Yue varieties are not mutually intelligible with other varieties of Chinese. They are among the most conservative varieties with regard to the final consonants and tonal categories of Middle Chinese, but have lost several distinctions in the initial and medial consonants that other Chinese varieties have retained.